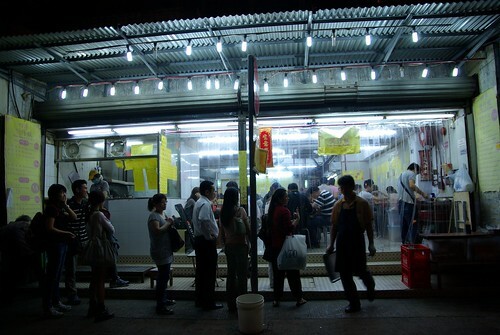 On the same night that we visited 365 Hennessy Rd, we followed our hosts to the other side of the city to Yau Ma Tei in Kowloon. What was the occasion? 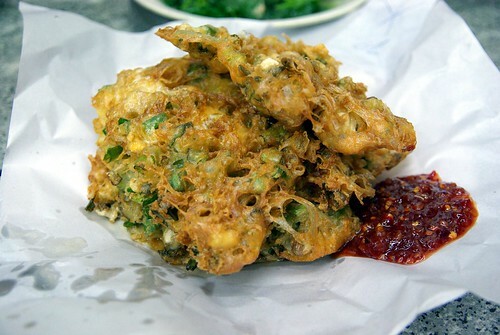 The occasion was pot rice, also called po chai fan 煲仔飯 in Cantonese. 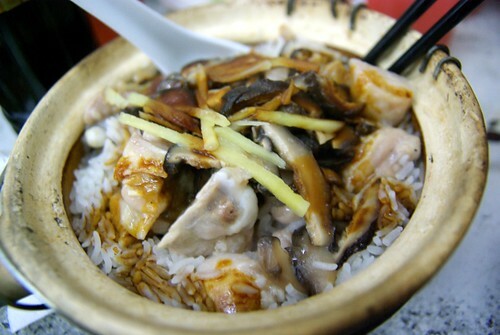 Po chai fan is rice in a clay pot served with various types of meat, vegetable, seafood or condiments on top of it. 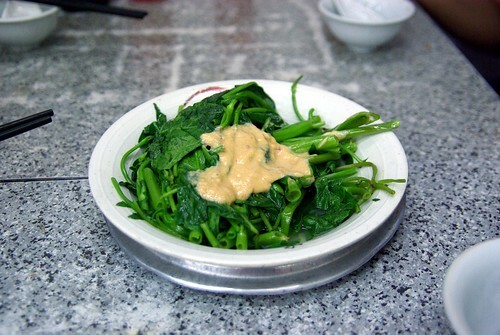 In cities like Montreal, pot rice can sometimes be ordered in a Cantonese restaurant, but usually requires too much work to be considered a typical dish that people order. In Hong Kong, pot rice can be the restaurant’s specialty, as it is the case for 四季煲仔飯 Four Seasons Pot Rice. The two girls who brought us here told us that the location used to be a family mom-and-pop hamburger restaurant. The current tenant has done nothing about the decoration: it’s simply a large hall covered in white tiles, with fluorescent lighting and huge fans blowing. Just like La Banquise has twenty or more types of poutine, you can choose from an endless number of “toppings” for your rice at Four Seasons Pot Rice. My friends had a variety of chicken, chicken feet and other meat, while I went for a classic chicken with Chinese mushrooms. The price for the single pot is also ridiculously low at $HKD22 for “regular flavours” (see menu), like combinations of two of Chinese sausage, salty fish, sliced pork, liver sausage and chicken.